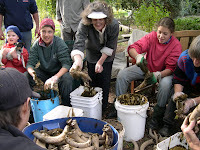 Deb Cantrill and members of the Adelaide Hills Biodynamic Group. – To investigate if it is possible to make a smaller version of barrel compost (also known as cow pat pit) so home gardeners can easily make their own. Investigate the possibilities of using other manures to bring in a range of animal influences into the home garden. Literature search on methods used worldwide. Set up 3 different sized composts in 3 different sized bottomless containers. 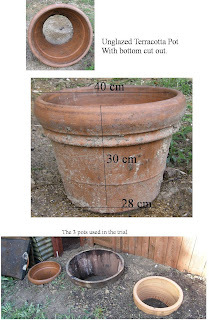 Unglazed terracotta pots where chosen because they could easily fit into a home garden and are also durable. The bottom is simply removed with an angle grinder. There is also a possibility of making a container to suit. They are easily removed when compost is complete allowing the space to be planted. Peter Proctor was using clay bricks in India. 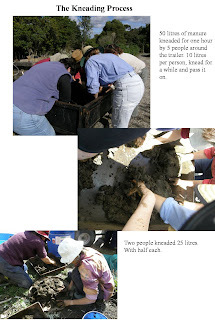 The process started on May 2nd 2009.Cow manure was collected from Claret Ash Farm. The manure was measured out. The 3 p ortions then had the egg shells and rock dust added and where ‘kneaded by hand for 1 hour. Mixed by 5 people. Each mixed 10 litres for a time and then passed it on repeated for the hour. Mixed by 2 people—1/2 each kneaded for 1 hour. Mixed by 1 person for 1 hour. After the hour each was placed in its appropriate container, biodynamic preparations added, covered with a damp sack & waterproof lid. JUNE 4th 2009 All 3 pits were inspected and mixed well with a fork. All looked much the same—the smallest was a little wetter & middle one a little dryer but after mixing the moisture evened out. The tops where smoothed and sack and waterproof lids replaced. All 3 pits matured displaying the same properties of humus development. Highly recommend that home gardeners use this method to produce their own therefore always having their own supply at hand. 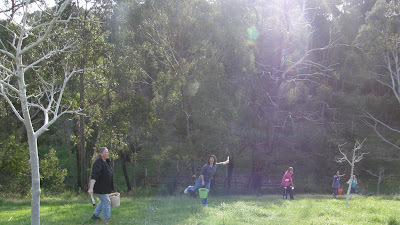 Adelaide Hills Biodynamic Group is planing to run this trial again in Spring to investigate the seasonal effect. 10 litres of manure will be used in the small barrel, making an easy 1 bucket measurement. It is also hoped Home garden members will quickly take up the method. Next autumn we will plan a trial using different mixes of manure to bring a more diverse range of animal influences to the home garden. 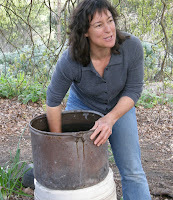 Deb Cantrill is an experienced biodynamic orchardist, gardener and educator. Establishing Nirvana Organic Farm in 1983.Deb is the Coordinator and preparation maker/distributor for the Adelaide Hills Biodynamic Group. Adelaide Hills Biodynamic Team: Chris Banks, Jan Sedunary, Robin Tait, Simon Martin, Martin Fry, Wendy Morris, Yi-Ting Wu, Cathy Smallridge. Also known as cow pat pit, ccp or manure concentrate. Barrel compost activates the soil and soil organisms, encouraging better soil structure and quicker breakdown of inorganic and organic substances. It is used to spread the ‘compost’ influences especially when converting farms. The development Barrel compost grew out of concern with pollution of Strontium 90 s from atmospheric atomic bomb tests in 1958. Maria Thun and Dr Ehrenfried Pfeiffer collaborated trialing various substances then cultivating plants. An unambiguous result was obtained by growing plants with eggshells and ground basalt; the plants did not incorporate or store any radioactive Stontium90. They then set about a way to bring these two substances to the biodynamic farm. Further experiments and trials saw the development of the barrel compost. Peter Proctor has developed its use especially on larger farms in Australia and NZ where there is little compost used. In India he has developed wide usage of the preparation. Although the barrel compost is made in a similar fashion all around the world the quantities of compost preparations, egg shells and basalt used vary although the amount of manure was around 50 litres End uses also vary see table below. Very little is written about its use in the home garden. Deb Cantrill recommends it use for home gardeners on compost heaps, worm farms and to make the whole garden ‘compost’ by guiding the breakdown process especially where heavy mulch are used to protect the soil from heat and dryness. Many of the uses in the table below are also applicable. *This was developed by Deb Cantrill and the Adelaide Hills Biodynamic Group to encourage and enable home gardeners to have their own supply thus increasing its frequency of use on the home garden. Bottomless Container* Terracotta pot with bottom cut out. Dig a hole 150cm deep and place bottomless container in hole and back fill up sides of container. Mix cow manure, rock dust and egg shells using a hand kneading action for 1 hour. You will observe quite a change. Place manure mix in container, add compost preparations as per usual. Cover manure with a damp hession sack. Cover container with waterproof lid. After 1 month fork over manure, smooth out and cover again. Check every 4 weeks or so. It should be ready in 3 months. Remove to storage container and store as per 500. CCP is generally applied in the afternoon. For a home garden take 20gm and place in 5 litres warm water. Stir as per 500 for 20 minutes and apply to selected area as per 500. In conjunction with stirring 500. Dip potatoes and dry before planting. Sprinkled into successive layers while building the heap. Add compost preps influence- guide breakdown and humus formation. AHBG Adelaide Hills Biodynamic Group. But….it was a perfect Adelaide Hills Autumn Day. The evening before saw 20+ mm of rain fall but the dawn saw a perfect day that allowed us to get our annual preparation made efficiently and with lots of conversation and catching up. First up the compost preps, we collected some nettles to make 504 and stuffed them into their terra pot, next we made 505, .503, 506.We went to retrieve 502 which had been made lasts spring and had been hanging in the walnut tree all summer but it had disappeared. It was finally located down the hill – last weeks storm had broken its string and set it free All the compost preps except 505 where buried in Deb’s garden to transform over the winter. The manure then arrived to fill the horns, we tried this new technique of putting a straw down the horn to prevent the air gap but gave up on this thinking it was useful for machine filling and our hand method did not require it. It was then off to the burial pit down the valley to bury the horns & finally bury the 505 down in the swamp. Next we were supposed to stop for morning tea but it did not happen instead we got stuck into the next job at hand being the making of 3 different sized barrel compost /cowpat pit. 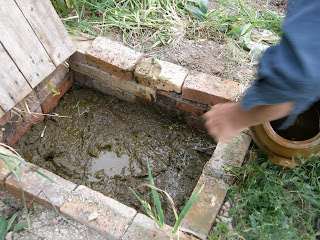 Being still inspired by Peter Proctor’s Indian experience we set about mixing the manure by hand for and hour. We use a kneading method which is such a wonderful unexpected experience .After the hour the compost preps were added to the 3 pit and our experiment had begun. Another successful season was celebrated as we dug up the compost preparations, and 500 revealing top quality preps ensuring future healing of our farms, gardens and the earth. Its now time to be putting out your spring preparations. Spring in South Australia is short as we move from cold wet to hot dry very quickly. 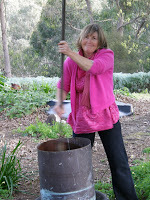 Last weekend our newest members p ut biodynamics into pratice, mastering the art of hand stirring some horn manure. They then put it out on parts of the Nirvana orchards. In October we will lift the horns and compost preparations burried in Autumn at Nirvana Farm. As well we will make a Cow Pat Pit and also demonstrate making casuarina spray. Members will be emailed the details. This is a talk given by Deb Cantrill at the Stirling Autumn Garden Festival on April 13th 2008. We all come here with different experiences of gardening & what it might mean to bring our garden to life. Imagine for a moment, a garden that is gifted with soil bouncing with life & fertility, superior water holding capacity, natural drainage, aspect & elevation then add sound gardening practices, a large diversity of plants, bees, earthworms, birds, insects, a well developed system of recycling all organic matter & the best conservation practices. The type of garden that feeds both the body & the soul. I know of no better way to achieve such a dynamic garden full of life & vitality. Over the last 25 years I have observed that using biodynamic methods are both a cheap and effective way of bringing gardens to life. 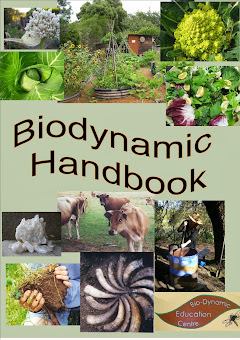 Using the Biodynamic methods is what makes organic gardening work. Biodynamics brings a totally new impulse towards rejuvenation and renewal of the earth as it ages and becomes tired and worn out. Organic gardening alone does not give this impulse. Like organics, Biodynamics largely about the health of the soil & a gardener would make and use compost, grow & utilise green manures, use crop rotations if applicable, & mulch to improve the soil but additional tools in the form of special preparations help guide the building of humus in the soil, the composting process & photosynthesis. But a biodynamic garden is more than using the preparations. In the 1920’s farming was relatively simple compared with today (what we call organic today), but farmers were beginning to notice decline. The Lucerne would no longer persist. Where once it had lasted 30 years in the same paddock, it grew for only 3 years. The seed strains were degenerating and animals were subject to more diseases. Rudolf Steiner was trained in science and philosophy and renowned for his spiritual yet highly practical approach to worldly affairs; e.g. new methods of education and medicine. He was approached by farmers for help. After much persuasion in 1924 he gave a series of 8 lectures to the farmers where he indicated some methods to develop and use. Since then methods have developed for practical application from experience and results of research. Although the method was developed for farms it’s equally applicable to gardens whether you’re growing food, herbs or flowers. 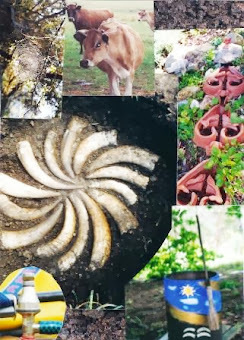 The Biodynamic method is very simple and can be applied by anyone on any scale from a few pots to large scale broad acre farming as well as everything in between. Underpinning biodynamics is a mixed culture which is typical in gardens but sadly being lost in agriculture & now days even on biodynamic farms. A biodynamic garden is self sustaining & always evolving. It develops its own identity & fertility season by season. How the ecosystem is structured up to you, the land & climate .Every garden will be unique but the aim is to have an integrated system all working together, like an orchestra & you as the gardener are the conductor. You can have a garden in tune or just making a ding. When a gardener is described as having a ’GREEN THUMB’ this often means they have an 6th sense, intuition about plants & the natural world. In general I think most people have this educated out of them. So we have to begin (often very slowly) to develop and trust our intuition through observation and experience, and develop a greater awareness of natural’s cycles. You also need to develop the ability to sit back ,observe & act when necessary rather than rush in & attack a problem e.g. control of some insect pests where treatment may turn out to be unnecessary if the natural controls be they parasites, predators, weather are given time to take effect. So start to develop your intuition & more importantly trust it! Once the dynamics of the system is started we can activate the biological life in the soil and to develop skills to nurture the soil, plants and animals. The tools used in the Biodynamic method use are generally known as THE PREPARATIONS. These preparations do not occur in nature rather they are made by ultizing substances taken out of nature from the 3 kingdoms. These preparations are made by the farmers or by BD groups and distributed through their membership. The Adelaide Hills Biodynamic group hold working bees to make these in autumn and spring. All members are invited to assist. 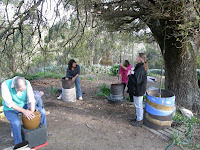 Assisting is also the best way to learn as the biodynamic method is very practical. 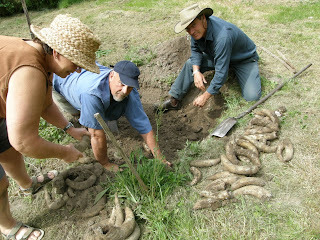 Members filling cow horns with fresh manure in the Autumn. The preparations consist of 2 groups; The Spray preparations & the compost preparations. Spray Preparations: consist of Horn manure 500 & Horn silica 501. *Horn manure 500 is used to enliven the soil, increasing the micro flora and availability of nutrients and trace elements. Through its application root growth in particular is strengthened in a balanced way. Horn manure is generally used in autumn & spring but can be applied at other times as long as there is moisture. It is stirred for one hour either by hand by machine or flow form depending on scale. It is stirred on a day like today after a bit of rain; find you a nice spot in the garden, in the afternoon when the earth is breathing in. Stir in a vessel like this. · Improved crumb structure in soil this means more air & water can be stored. Horn silica 501 enhances the light and warmth assimilation of the plants, Photosynthesis leading to better fruit and seed development with improved flavour, aroma, and colour and keeping quality. It is stirred in the same way as 500 how ever t except in the early morning when the earth is breathing out remembers the rising mists. It is sprayed out as a fine mist & tends to drift across the garden. We use even less a tiny pinch in 5 litres. The making & incorporating quality compost is a vital part of any biodynamic garden. The use of Compost is essential in creating and maintaining quality humus & biological life to enliven the soil. Great care is taken in producing quality compost. Compost Preparations: (502 - 507) are added to all Solid & liquid composts. Imagine the compost heap is a body, when we add the 6 preps they are like organs they get the heap working in a balanced way. One of the most important things to understand when making compost are the 2 main processes. The breakdown of organic matter & then the most important the build up of new substance HUMUS. In the soil humus can be oberserved in good crumb structure & the slippery colloidal nature of the soil partials. (Rub soil between fore finger & thumb-smooth & silky where there is humus. As opposed to rough & sandy- silty, granity soils or sticky in clay. Cut out a square soil run finger down the profile. Mean while I enjoy being part of a system that reconnects me to nature & that teachers me a greater appreciation of its wonder. At the same time as producing quality food for my table & beauty to feed my soul. Biodynamic gardening can bring your garden to life . Autumn evening, descending moon. Two days previously the rain stopped after being with us continuously for two weeks. Typical North Coast April weather. Creeping along the contour the little tractor slips sideways on the wet hill as the uphill wheels negotiate a bump. Torn between the need to maintain constant velocity and the need to stay on all four wheels I slow down, backing off from the 5 km/hr that I been told will give optimum coverage of 3 gallons of 500 per acre of ground. How can those little droplets be affecting the soil structure and biological activity of the paddock? How can an ounce and a quarter of old moo p00 mixed in 3 gallons of water have any effect on a whole acre of ground? Am I risking my life for nothing? “it’s the worm eggs in the 500”, or: “it’s loaded with micro-organisms”. But I couldn’t help thinking that if that was the case the dose rate would not be as critical as people said it was. Why would double the dose rate of worm eggs be less effective than just the right amount of them? How does 500 work? Field days I had been to tended to concentrate on technical matters like the shape of the vortex in the mixer and droplet size in the spray nozzle. The few books that I had read did not answer the fundamental question to my satisfaction. For many, the fact that 500 seemed to enhance soil structure and biological activity was enough. For me, however, the need to formulate an understanding of the process, even a wrong understanding, was becoming a priority. So I set out in search of an under standing, even if it be a wrong understanding. One book that I had barely looked at in those days was “Agriculture” by Rudolf Steiner. The eight chapters of this book correspond to the eight lectures which Steiner delivered in 1924 to get the biodynamic (BD) movement started. Several attempts on my part to grapple with its contents had led to frustration. The jargon was unfamiliar, no doubt it was related to Steiner’s anthroposophical philosophy, something about which I knew nothing. Fortunately I was not alone in my frustration. A few other members of the local group turned out to be similarly motivated to grapple with Steiner. One of them even admitted to having already ploughed through the book once on his own. He became our discussion group leader. We agreed to meet once a month and to tackle a chapter each time. In Nature — and indeed throughout- the Universal being — all things are in mutual interaction; the one is always working on the other. So says Rudolph Steiner in the seventh lecture of his eight lecture course. By the time our group had reached this point there were only four diehards left out of the ten who started. “All things are in mutual interaction” says Steiner. The modern western science of ecology concerns itself with studying these interactions. In agriculture, as in nature there are connections & relationships. The connection between the bird and the grub gives us biological pest control. The honey bee’s relationship with the flower provides her with food and us with honey. It also helps to ensure fruit set and assists in the propagation of the plant on which the flower grows. But according to Steiner there’s more to mutual interaction than that. ‘…..it is the interplay of inward- pulling gravity and outward-sucking ether (levity) which brings to ‘expression the forms and the rhythms of all life on the physical plane. Just as gravity can manifest in a general way or as centers of gravity in individual objects, so too does the etheric behave both as a general force working from the infinite periphery of the cosmos or as individualized activity in living organisms; in the latter case it functions as what is known as an “etheric body” or “body of formative forces”. Every living body from the lowest to the highest has a corresponding “etheric body” or “body of formative forces”. etheric bodies of living organisms. Previously only visible to clairvoyants, can now be detected objectively using a technique called Kirlian photography. He claims that healing methods like homeopathy actually work at the “vibrational” (as opposed to the material) level on the etheric body of the patient. One of the functions of the etheric body is to provide what Gerber refers to as a “holo- graphic energy template”. This template guides “the cellular growth of the physical structure of the body”. In this way, for example, the pattern of lines on the fingerprint is precisely replicated after an injury. And it’s the etheric body that organizes the composition and arrangement of material cells in the developing .fetus or the sprouting seed. Because the etheric body underlies and energizes the physical body and to a large extent controls events at that level, there is obviously great potential for healing the physical body by intervening at the etheric. One of the inter faces between the etheric and physical bodies is the set of acupuncture meridians. By balancing the flow of subtle energy in these meridians the acupuncturist is able to bring about healing in the actual physical body. According to Gerber there are even more subtle levels of existence associated with animal and human beings. Even more refined than the etheric is the emotional or “astral” body. It’s only in the last few decades that Western medicine has fully acknowledged the link between emotional stress and physical disease. However, in the early part of this century Dr. Edward Bach “perceived that the illness-personality link was an outgrowth of dysfunctional energetic patterns within the subtle bodies”. The Bach flower remedies are the product of the work that followed on from this insight. “The astral energies have their impact upon the physical brain and nervous system through their subtle linkup with the etheric body and it’s inter connections with the physical body. Unlike the etheric body which supports and energizes the physical body, the astral body also functions as a vehicle of consciousness which can exist separately, yet connected to, the physical body”. In his commentary on Steiner’s ‘Agriculture” John Soper indicates that the etheric bodies of plants, animals and humans are directly nourished by a stream of etheric forces continuously flowing in from the cosmos. In animals and humans the astral bodies are similarly nourished by streams of even subtler astral energy which originate, as the name suggests, with the planets of our solar system. While plants do not possess astral bodies as such, they too are connected to the astral realm and are embedded in a cloud of astral energy. Homeopathic medicines and Bach flower remedies cure illness by operating at the subtle or vibrational level. They make positive changes to the astral and etheric bodies. These changes are relayed down to lower levels and thus affect the physical manifestation of the disease, similarly, it seems; the biodynamic preparations work at the vibrational levels. Applications of 500 affect the astral and etheric levels of an agro ecosystem. These higher level changes translate into improved soil structure and biological activity at the material level. In medicine and agriculture there is a similarity in the contrast that exists between the mainstream/materialist paradigm and the alternative/ vibrational approach. In the following passage from his commentary on Steiner (Chapter 5), John Soper highlights this contrast in relation to plant nutrition. “The modern approach to manuring (i.e. fertilizing) insists that the chemical substances (i.e. nutrients) taken away with each crop, including nitrogen, must be returned to the soil in some form or another - the cheaper the better: there is a soil reservoir of plant nutrients which must be kept up to a definite level if yields are to be sustained. To a certain extent this approach is correct... But when we come to look at the plant/soil cover as a living whole, we see that there must also be a reservoir of life force which has to be considered, for we remove forces as well as substances at harvest time”. “Not only should we conserve and return all residues of living things before they have become completely dead and mineralized, but we should also strive to create conditions under which plant and soil become sufficiently sensitive to react to and absorb the incoming stream of life from the cosmos. In this way we can replenish the life reservoir and ensure both quantity and quality of our produce”. What I understand from this passage is that it’s as important to get it right at the etheric and astral levels as at the material level. Conventional and indeed organic farmers, being totally concerned with matching material nutrient inputs to outputs miss this point. If I under stand Soper and Steiner correctly, a system which is sufficiently sensitive to the incoming stream of life forces will take care of the material nutrient needs of its plants automatically. The controversial topic of biological transmutation gets mentioned in this context. Australian agriculture is heavily dependent on non-renewable inputs of phosphate. On current estimates world phosphate deposits will be exhausted in just three generations. The argument that goes on between conventional and organic farmers over the rights and wrongs of super- phosphate will be irrelevant in 70 years. • That, I now gather, is what I am doing when I spray the paddocks with 500. It’s taken me five long years to figure that out. I’m not sure whether I feel resentful or grateful for the fact that nobody just gave me a model that I could understand back then at day one. Maybe they did and I just didn’t hear them. At any rate I’m not sorry that I had to work through Steiner’s “Agriculture” as there have been many spin-off benefits. In fact we’re going through it again, only more painstakingly this time. It now takes us several hours to get through half a chapter. Passages that were meaningless at the first reading now demand attention. Being a materialistic/rationalist by nature and conditioning I have found it difficult to accept much of what Steiner says. However from my own experience, and that of others, BD seems to work. It seems logical therefore to accept the fact that the “finer forces” of which Steiner speaks are indeed constantly streaming in from the cosmos and that the BD farmer’s main task is to sensitize his or her system to them. ‘In the dung, therefore, we have before us something ethereal and astral. For this reason, it has a life-giving and also astralising influence upon the soil. .
I’m now at a stage in this saga when I am able to accept statements like that without a cynical smirk. I even find myself feeling grateful to Dr. Steiner, not just for pointing me towards way of farming that doesn’t deplete non-renewable resources, but also for helping me in my personal .struggle to understand the mysteries of life and he universe. While most farmers ,Dept of ag, Landcare people struggle for a definition of sustainable Agriculture and spend hour in meetings discussing this, BD farmers, all over the world are out there working the land in a sustainable way. It may be viewed as muck and magic by some..... but proof is in the health of the soil and food produced. Science is catching up and the proof will be in the scientific journals as well. The Bio Dynamic method is a modern organic method that grew out of the farmers concerns that the agriculture system was failing. Rudolf Steiner was trained in science and philosophy and renowned for his spiritual yet highly practical approach to worldly affairs; eg. new methods of education, music and medicine. The farmers approached Seiner for help. After much persuasion in 1924 he gave a series of 8 lectures to the farmers where he indicated some methods to develop and use. Since then methods have developed for practical application from experience and results of research. The growth of B D has been slow owing to fears that it might be misused or misunderstood and is often described as “way out”, but it is very simple and can be applied by anyone on any scale from a few pots to large scale broad acre farming as well as everything in between. BD brings a totally new impulse towards rejuvenation and renewal of the earth as it ages and becomes tired and worn out. Organic farming does not give this impulse. One of the most enjoyable and challenging thing about BD is speculating about how it works. So What is Bio-Dynamic farming or gardening?...have you seen it on TV. WINTERS TALE. Horns things, Alex Podolinski. Oh! yes they plant by the moon..
First and foremost its a method of farming or gardening concerned with producing quality food of reasonable quantity. The method is to activate the biological life in the soil and plants and to develop skills to nurture the soil. To me BD agriculture is the craft of farming .The farmer is a skilled ,in tune craftperson, just like a skilled cabinet maker, using quality wood to make a fine table that will last forever. Compare that to a massed produced table made from chipboard & staples, made to a price by machines, just like factory farming. DO THESE PRODUCTS LAST OR SUSTAIN. It is a method of farming or gardening concerned with producing quality food of reasonable quantity. The method involves the activation of the biological life in the soil and to develop skills to nurture the soil, plants and animals. Bd is basically organic, aiming at having a well structured soil, rich in humus & high in biological activity, which is incorporated into a self sustaining eco system. The methods BD different The farm is viewed as a living organism & the use of specific preparations made from farm sourced materials. These are not fertilisers but act in a way to increase the vitality of the soil, plants and nutrient cycles. In developing a good organic system you need to develop the ability to sit back ,observe & act when necessary rather than rush in & attack a problem eg control of some insect pests where treatment may turn out to be unnecessary if the natural controls be they parasites, predators, weather are given time to take effect. you need to develop your intuition & trust it! Being a farmer is working with a life . Whenever I'm introduced to someone as a BD or organic farmer I'm immediately asked “HOW DO YOU GET RID OF.......?”Farmers and gardeners go out in the morning NOT with life on their minds but death they want to get rid of everything that is not their crop , You only have to listen the gardening shows to get my drift. A balanced natural system. takes time to develop .. we need to be aware of all the elements of life & should take time to become closer by observing, keeping records & learning from nature. When using the bio-dynamic preparations we are attempting to work directly with the forces of growth and development which are inherent in all living things. This “lifeless ‘or “livingness” of things does not just magically appear and disappear, but always is and is everywhere. It expands contracts and transforms under certain elemental conditions These elemental conditions as warmth (fire) air (light) water and earth (mineral). If you think of the way the seasons express themselves or a plant passing through successive states of seeding, flower, fruit and seed. · Spray Preparations: Horn manure (500 ) & Horn silica (501) both are mixed with water and stirred for one hour. · Compost Preparations: (502 - 507) are added to composts. These preparations are made by the farmers or by BD groups and distributed through their membership. The Adelaide Hills BD group hold working bees to make these in autumn and spring. All members are invited to assist either with their time or other donations i.e. manure. herbs or cash to ensure a supply of quality preparations for all members. Assisting is also the best way to learn about the preparations. * Horn silica 501 enhances the light and warmth assimilation of the plants, leading to better fruit and seed development with improved flavour, aroma, colour and keeping quality. * Compost preparations 502-507 help the dynamic cycles of the macro and micro nutrients via the biological processes which lead to humus formation. Members make the BD preparations. These are then available to members. Members have access to additional information through our library. A study group meets on the first wednesday of the month. 7.30- 9.30. 2013 -Sunday, Sept 22nd.at Nirvana Organic Farm. Workshops can be conducted outside the set dates depending on demand.If interested register your interest.